Keep it dark and sophisticated! 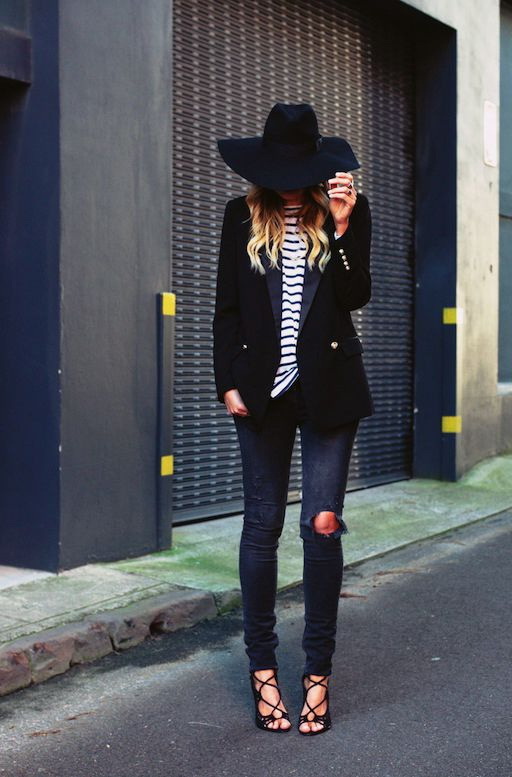 I think its time to show you my favorite ways how to wear black jeans this year. No, it’s not a new trend or something groundbreaking, but these denim bottoms look really awesome and they are very easy to style. You can find so many interesting people who wear black jeans in real life, starting from bloggers, models, rockers to editors and ordinary ladies. Indeed, there are so many fans of black jeans. We see lady who appears on the streets of New York City wearing a beige trench coat, burgundy double-breasted blazer, black-white striped top and black skinnies completed with pointed-toe black pumps. It’s no secret to anyone that jeans are essential in a modern day fashion. Every lady has at least one pair of jeans in her closet. Why? This denim piece goes with almost everything. These bottoms are extremely versatile and come in so many different styles and colors. But we are here to talk about black jeans. You are free to choose whatever style you want, starting from the ones with rips, holes in the knees, skinnies to flared, bootcut and regular ones ideal for office hours. The key to look awesome with black jeans is to pair them with the right tops, shoes, jackets, accessories and jewelry. Think of sweaters, blouses, blazers, leather jackets, hats, chunky jewelry, etc. Anyway, if you are looking for some of the best ways how to rock black jeans, then you better get inspired by this awesome compilation of street style images.